Stuttgart. Stronger, wider, faster the new version of the Porsche 911 GT3 Cup offers its many customers the world over even greater value than ever before. The successor to the best-selling racing car of all time built in a production series of more than 1,400 units is based for the first time on the 911 GT3 RS, with the weight of the racing model reduced significantly versus the lightweight road-going version. This is the first GT3 Cup to feature the 44-millimetre (1.73) wider body at the rear, providing sufficient space for even larger wheels. Wider wheel arches also at the front clearly show that the front wheels are likewise new. The new GT3 Cup is clearly recognisable at very first sight through the special looks and design of the front end. The striking daytime driving lights come straight from the current generation of the 911, the front body panels are the same as on the 911 GT3 RS. The front spoiler lip is however 15 millimetres or almost 0.6 lower to provide significantly more downforce on the front axle. 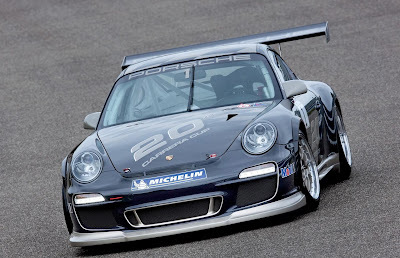 Downforce on the rear axle is also increased by the rear wing extended in width from 1.46 to 1.70 metres (57.5 to 66.9) and fitted higher up as a feature carried over from the even faster 911 GT3 Cup S in international FIA GT3 racing. The rear air dam with its striking air vent openings as well as the rear lights in LED technology, in turn, come straight from the road model. The power unit featured in the new 911 GT3 Cup is largely identical to the production engine in the 911 GT3 RS same output of 450 bhp and same maximum engine speed of 8,500 rpm. Capacity of the Cup engine, however, is up from 3.6 litres on the former model to 3.8 litres on the new car, helping to increase engine power by 30 bhp. A racing exhaust system with a fully controlled catalytic converter helps to reduce harmful emissions to a minimum. As an exclusive feature in the Porsche Mobil1 Supercup held on the occasion of the FIA Formula 1 World Championship races, the new 911 GT3 Cup comes with a modified, special exhaust system offering an even more dynamic and muscular sound. Another feature exclusive to the Supercup version is PCCB Porsche Ceramic Composite Brakes also available on Porsches road models. 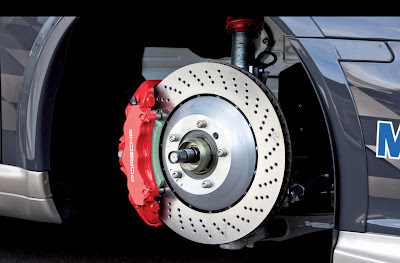 Compared with the composite cast brake discs featured on the Carrera Cup cars, this reduces the weight of the car by approximately 20 kg or 44 lb. The new Porsche 911 GT3 Cup available exclusively in Carrara White will be delivered to customers as of the end of October. In the upcoming season it will be raced in no less than seven cup trophies not only in the Porsche Mobil1 Supercup on the occasion of Formula 1 races, but also in the Porsche Carrera Cups in Germany, Asia, Japan, and Italy, as well as the GT3 Cup Challenges in the USA and the Middle East.